There are three different airports in Washington D.C., all of which are shared by locals and visitors alike. Sometimes airlines will offer better prices if their flight lands at one airport as opposed to the others, while some flights may only be available at one or two of these airports. Location: This is Ronald Reagan Washington National Airport and is usually referred to as National Airport for short. Located in Arlington County, Virginia, it’s the closest airport to the downtown area of Washington D.C., which makes National Airport the most conveniently located of all airports for visitors who want to go to the heart of the city as well as for residents who live in this area. How to get there: You can get to the airport via the Metro. Using the Blue or Yellow lines will get you to the Ronald Reagan Washington National Airport Metro Station. The covered walkway will take you to the terminal. Traffic and congestion: One thing you’ll notice about National Airport, however, is that it’s prone to congestion during rush hour. This is because it’s close to the downtown area. Much of the traffic will affect those coming from Maryland and Virginia. If you’re heading to this airport, allot a significant amount of time to get there so that you don’t miss your flights. Relevant information: This airport has short runways, which effectively limits its flights to mostly domestic ones, with an exception to a few flights to the Caribbean and Canada. National Airport was actually one of the first airports to apply the TSA pre-check program, which offers faster screening lanes for members of the frequent flyer programs of US Airways, Alaska Airways, and Delta Airways. This is also available for US military members, who can bring their Common Access Card (CAC) to the checkpoint, as well as those who have Global Entry passes. Location: Dulles International Airport is located in Chantilly, Virginia, just 26 miles away from Washington D.C. It’s roughly a 40-minute ride from Washington’s downtown area, assuming that it isn’t rush hour. The IAD access road is easy to spot and access upon getting off the I-495. How to get there: Those who want to go to the airport have different options and can take either a taxi or the shuttle. Since Washington gets congested sometimes, make sure to allot additional time for traveling to the airport in order to catch your flight. The Silver Line Express is also available for direct trips to the airport. Waiting times: IAD was the first ever airport to adopt a system that calculates the waiting time for security checkpoints. These estimated times are displayed in real time, allowing passengers to choose lines with shorter wait times when they go through airport security. Location: Designated BWI for short, the Baltimore/Washington International Thurgood Marshall Airport lies just south of Baltimore, making it a convenient airport for those who come from the Maryland suburbs travelling along I-95 and I-295. 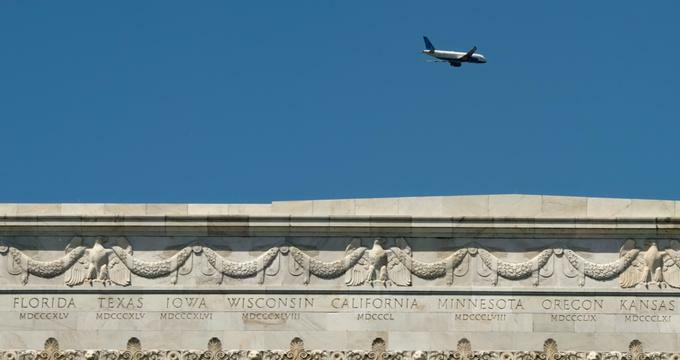 How to get there: The MARC and Amtrak train station is closest to the airport, offering a service to Union Station, headed for Washington D.C. Relevant information: Those who tend to fly on Southwest Airlines will be flying through this airport a lot. They’ll also be getting cheaper fares compared to other airlines. BWI also happens to be where the Department of Homeland Security tests its latest airport screening methods. This results in security lines being longer than at other airports, so you might want to factor that in to your plans. - Metro rails: The MARC and Amtrak station provides direct rides to the Baltimore-Washington International Airport and National Airport. Meanwhile, the Dulles International Airport Silver Line Express is the IAD’s official Metro Rail service. - Shuttle services: There is a wide selection of shuttle services that take passengers to the airport. The most common one is SuperShuttle, which is available 24 hours a day and does door-to-door servicing within the Washington metropolitan area. To book shared rides, call 1-800-BLUEVAN. The Supreme Airport Shuttle (800-590-0000) is another company that offers door-to-door service. - Taxis: All airports have taxis waiting for passengers outside the airport. National Airport and BWI have taxis waiting just outside the baggage claim counters, while those who arrive at the IAD can hail cabs at the lower level of the terminal. - App-based services: Anyone with a smartphone can easily book an Uber or Lyft to arrange for a private vehicle to pick them up from or take them to the airport. Both apps offer reasonable and fixed prices. You can even get cheaper prices with shared rides. Tip: If you’re at the airport, you can try to access the airport’s Wi-Fi to use these apps. - As mentioned before, don’t forget to allot time for traffic. Washington is a busy place and you might get caught in the middle of traffic while on your way to the airport. - When using any of the transportation services to and from the airport, make sure that you know how much you’ll be paying. While rates may change without notice, it’s important to have an idea of how much each ride costs to avoid complications. Bringing exact change helps. - Airports have parking spaces, but if you’re planning to catch a flight (as opposed to picking up or sending off a passenger), you’re better off taking an arranged transport service. Finally, it goes without saying that you must always check your booked flights to ensure that you know which airport you will be using. You don’t want to end up wasting time going to the wrong airport.